As early as the first century, the Church set aside every Friday as a special day of prayer and fasting. It was not until the fourth century, however, that the Church began observing the Friday before Easter as the day associated with the crucifixion of Christ. First called Holy or Great Friday by the Greek Church, the name "Good Friday" was adopted by the Roman Church around the sixth or seventh century. 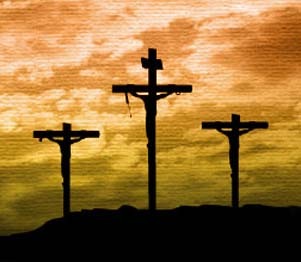 There are two possible origins for the name "Good Friday". The first may have come from the Galician Church in Gaul (modern-day France and Germany). The name "Gute Freitag" is Germanic in origin and literally means "good" or "holy" Friday. The second possibility is a variation on the name "God's Friday," where the word "good" was used to replace the word "God," which was often viewed as too holy to be spoken aloud. Good Friday rituals and traditions are distinct from every other Church observance. The ceremony is sombre, with priests and deacons dressing in black vestments. The pulpit and the altar are bare; no candles are lit. The purpose behind the solemn presentation is to create an awareness of grief over the sacrifice of God's only begotten Son. In certain churches and starting anytime between midnight and 3 a.m., priests and other clerics begin to recite specific prayers. At the morning ceremony, the priest or church official recites lessons from the scriptures. Afterward, there is a succession of prayers asking for God's mercy and forgiveness on all mankind. At the noon hour comes the Adoration of the Cross, where a representation of the True Cross is unveiled and the clergy and laity pay homage to the sacrifice of Christ. In the Jerusalem Church, a remnant of the True Cross itself is presented for the ceremony. Next comes the Mass of the Presanctified, in which the priest or church official takes Communion from the host that was blessed during the Maundy Thursday ceremony. The ceremony concludes around 3 p.m. with a procession, which is followed by evening prayers. In many Protestant churches, Good Friday observances begin at noon and last until 3 p.m. This coincides with the hours that Jesus hung on the cross. These services often include sermons on the last seven phrases that Jesus spoke while being crucified. Other services include re-enactments of the Passion according to the Gospel of John, processions of the Stations of the Cross, and the singing of appropriate hymns. To many Christians, Good Friday is a day of sorrow mingled with joy. It is a time to grieve over the sin of man and to meditate and rejoice upon God's love in giving His only Son for the redemption of sin.